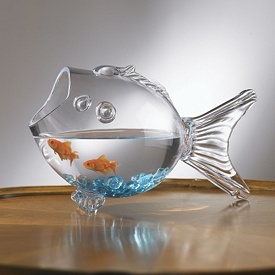 cease striving « Living Life in a Fish Bowl! Sadly too often our words/actions reveal that we have forgotten who God is. It seems that the temptation to give in to frustration, irritation, or stress takes no effort at all. When was the last time you really set out to have a bad day and you gave it all you had to be as stressed as you possible could? Like I said, it takes no effort to go along with irritation. What does take effort is to refuse to give in to the negative pull. It takes effort to put your faith in action and trust God in the midst of difficulties. God reminded me again recently that when I am frustrated – I have taken my eyes off of Him. Not one thing that is going to happen today takes God by surprise. Whatever today holds, we know who holds us. Maybe it’s time to pull away from the activities for awhile and spend some time alone with God.